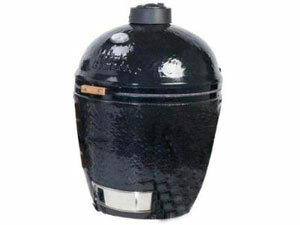 Primo Ceramic Charcoal Smoker Grill has a unique and an intelligent oval design for providing greater flexibility and versatility in grilling. It comes with 280 square inches of standard cooking surface, which is ample enough to not get crammed while cooking. The exterior ceramic has been made scratch and rust resistant by glazing it with protective, lead-free porcelain. The ceramic too is of high quality to increase its grill life and effectiveness. The grill has dimensions 30 by 21-1/2 by 21-1/2 inches and comes with a 20-year warranty for all ceramic parts. The grill has been designed such that it retains maximum heat inside and maintains the required temperature. Users wouldn’t have to worry about undercooked or overcooked food. The grill is sizeable enough to cook for three to four people at a time. The oval shape helps in optimizing the usage and getting maximum food on the grill. The process of long smoking foods is much easier with this grill. The grill has a larger smoker capacity and makes perfect smoke rings. The grill requires very less effort and time to clean and maintain. The ash can be cleaned out with the ash tool and it’s free of any grease mess. The grill’s flush and reverse filling racks allow users to grill food at different intensities, according to their own likings. The stand for the grill is sold separately and some users might not be satisfied with quality of the stand. There is a possibility that it might even detract from the grill. Some users might experience that interior of the ceramic bowl isn’t as sturdy as the exterior and it may crack or wither with too much heat. As the grill doesn’t come with portability features, users might find it heavy to move around and shift. Users may find it difficult to monitor and maintain the temperatures inside the bowl initially, without significant practice. Primo Oval Ceramic Charcoal Smoker Grill is highly recommended for individuals who want a dividable firebox to make indirect cooking easy and quick. There is no other Kamado grill that competes with Oval grill in this regard. The grill has been constructed with quality and a durable ceramic exterior to provide users with grilling excellence. Take care while shifting and maneuvering the grill, and it will last long and serve users with the best quality food.